The outstanding gumbo, fried chicken, and pie are already some of the best in Houston. 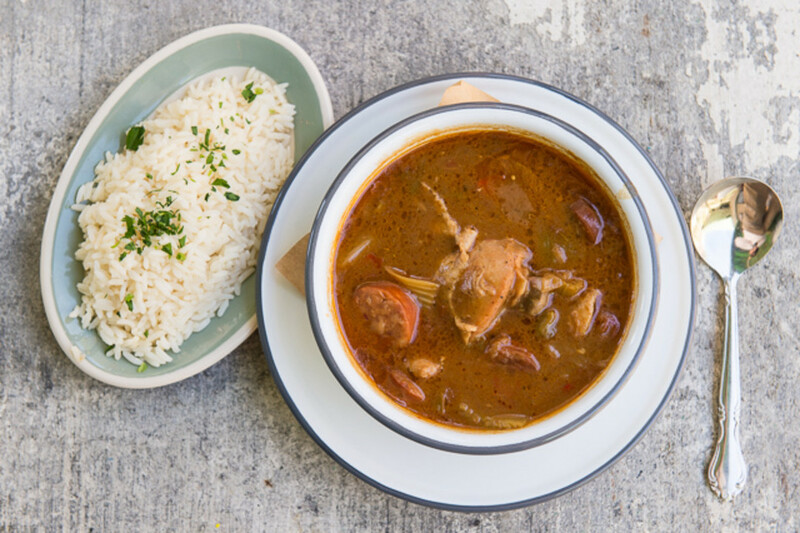 The andouille sausage-laden gumbo at Punk's is among the best in the city, if not the state. I had strains of Etta James’s At Last running through my head as I supped on the Good Ol’ Boy Gumbo at Punk’s Simple Southern Food last week—gumbo with andouille sausage actually from Louisiana, by god. 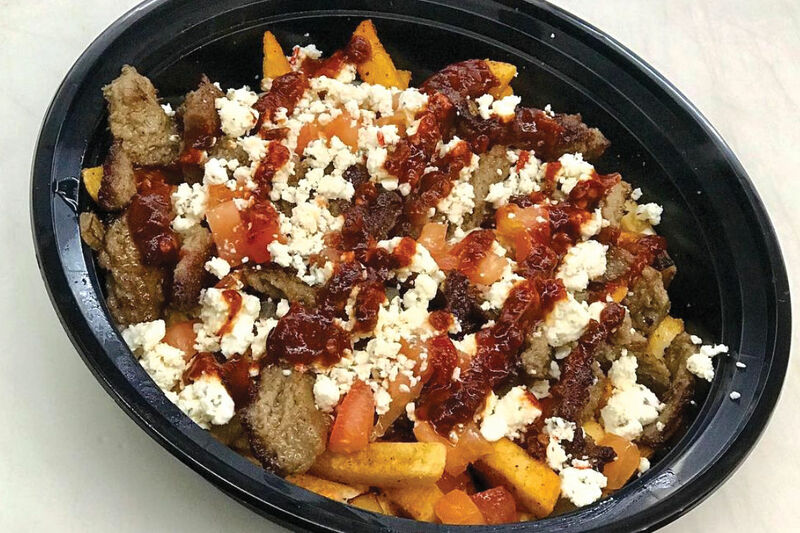 Houston, if not the entire state, is plagued with lackluster, substandard gumbos. I can count on one hand the number of gumbos I’ve had in Texas I thought had a chance of competing with the one my husband makes. He makes an annual sojurn to LaPlace, Louisiana to secure a supply of andouille from Bailey’s. I probably get more excited anticipating his traditional post-Thanksgiving turkey and andouille gumbo than the actual holiday meal—and I love Thanksgiving dinner. One of those worthwhile gumbos is at Danton’s, where I'm a fan of chef Danton Nix's deep, chocolate-brown roux. Another is at Boudreaux's, one of the last good restaurants still standing on the banks of San Antonio’s now overtly touristy, chain restaurant-driven Riverwalk. Haven recently retooled their gumbo based on an employee's mom's recipe and it was stellar when I had it a few months ago. 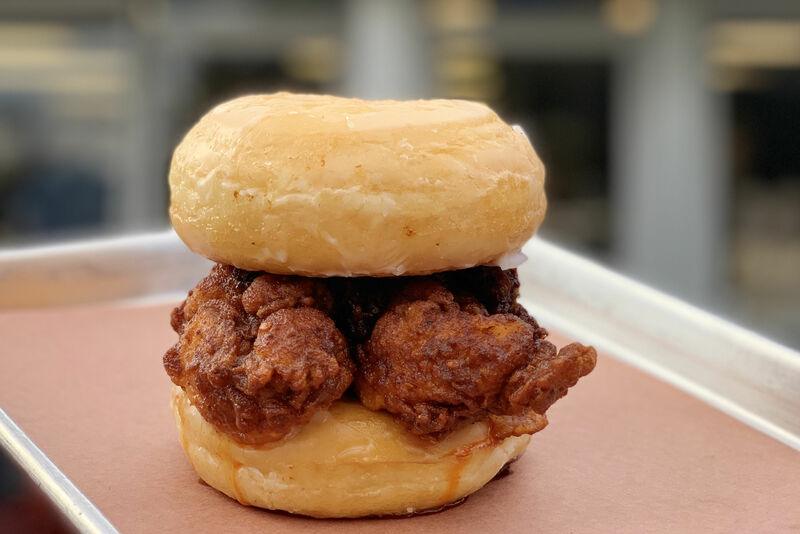 The one at Punk's now joins my very short list of worthy gumbos, thanks to plenty of that andouille sausage, a little bit of heat, and a luxurious texture. 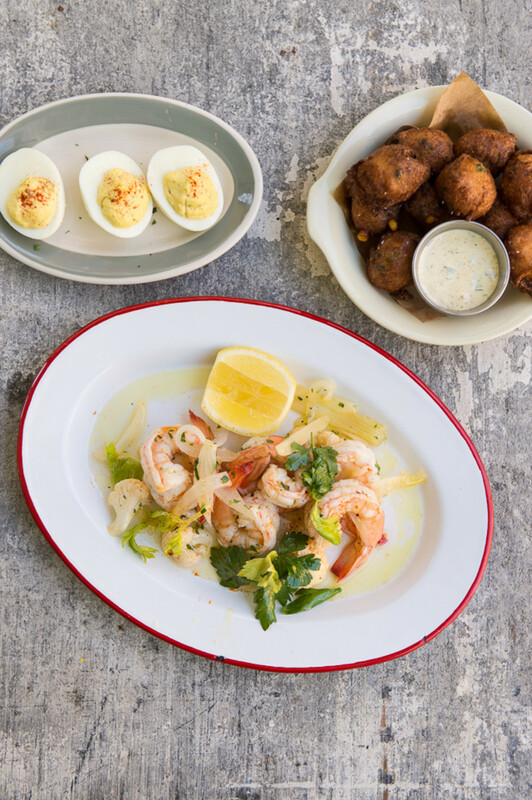 The menu features such Southern standards as deviled eggs, hushpuppies, and a pickled shrimp salad. 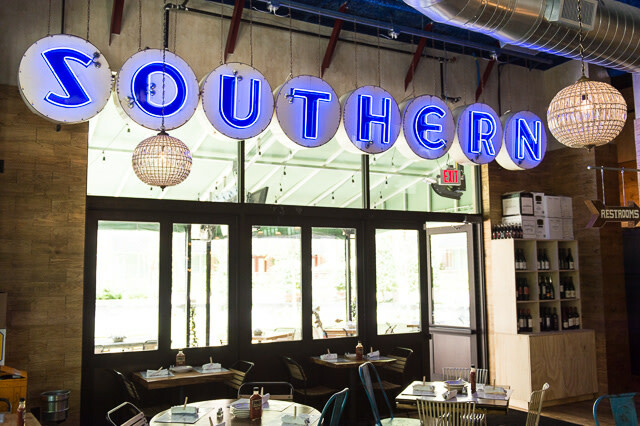 The “Southern” in Punk’s full name doesn't necessarily connote Texan or Creole, as the menu draws from all over the South. The pickled shrimp salad, for example, is a Lowcountry classic. It’s a delightful, refreshing starter studded with with onion, celery, jalapeño, fennel, and cauliflower—and a reminder that not all Southern food has to put meat on your ribs. Another often disappointing food in Houston—at least to me—is fried chicken. Once I get past the fast food havens of Frenchy’s and Popeye’s, I'm unimpressed with the rest of the city's options. 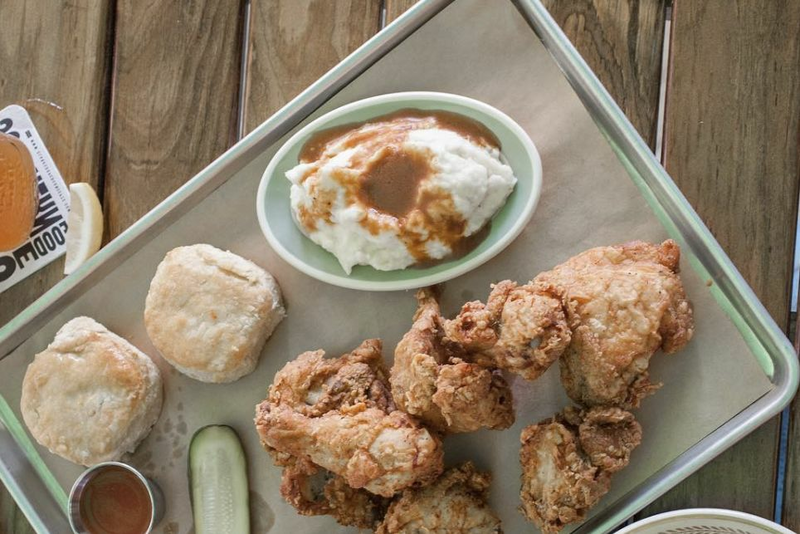 Haven's fried chicken has been inconsistent for me, although the sides are always stellar. Barbecue Inn? Maybe, but when I tried it, I found the crust excellent but the chicken bland. Brining chicken before frying it is a basic principle, yet I find it is rarely done to add that needed flavor and moisture. 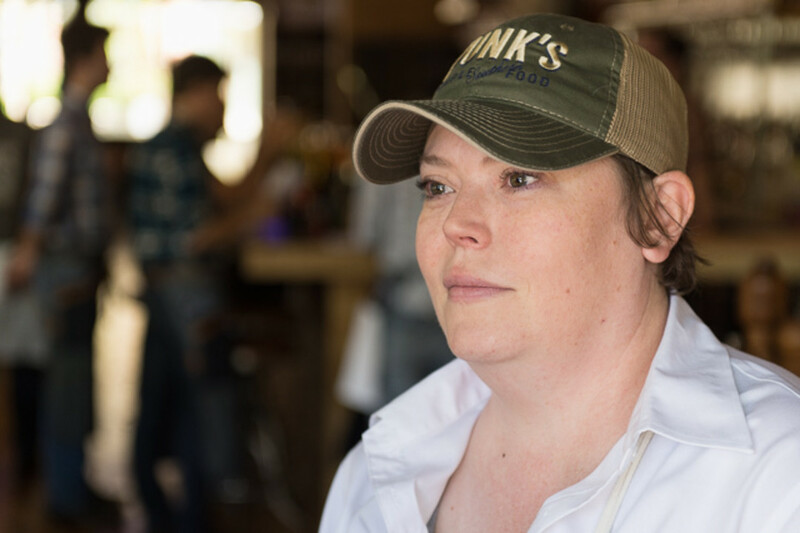 Of course chef Brandi Key brines her chicken. And it shows. You bite through the crispy crust and are not disappointed at the well-seasoned chicken underneath—there’s follow-through on the experience. I liked the homestyle presentation as well: the chicken is served on a sheet pan along with your choice of sides. We had some stellar braised collard greens and a old-fashioned macaroni and cheese dish that was simple and comforting. I like fancy platings as much as the next person, but sometimes it’s a relief to get away from them and just eat without all the pomp and circumstance. Texans might find the mashed potatoes and red eye gravy a little odd as the origins of this dish are in Virginia. There, red eye gravy is made with the drippings from a Smithfield ham and coffee is added to provide the distinctive flavor and color. It’s not the typical cream gravy served in Texas. As for the potatoes, there's a tart (yet not spicy) flavor from the horseradish that’s added to them. This may not be what you expect of your mashed potatoes and gravy, but it's well worth trying regardless. 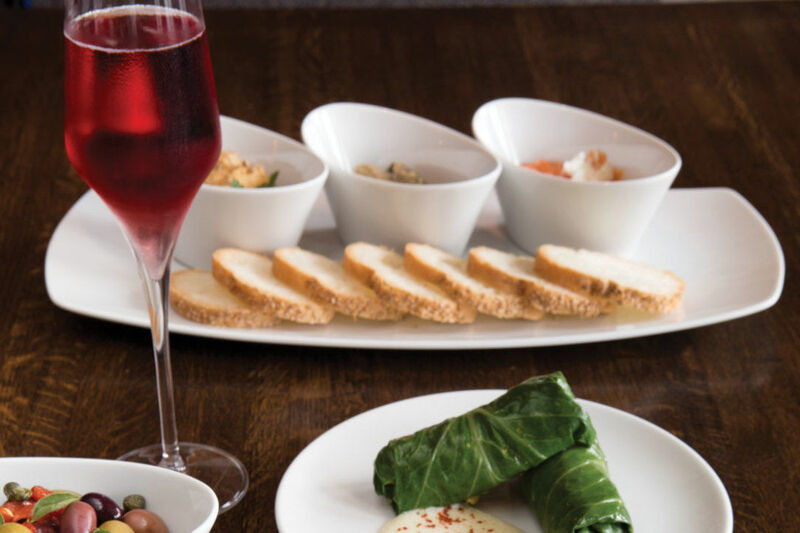 You'll want to add an order of deviled eggs and some lighter-than-air hush puppies, too. The deviled eggs remind me of those my mom used to make with mayo, relish, and a little mustard. I have no higher praise to give than that. As for the hush puppies, I try to not eat a lot of carbs but I ate every last one of these. I just couldn't help myself. There are whole kernels of corn inside, but the hushpuppies remain light and crispy, like tiny, savory beignets. 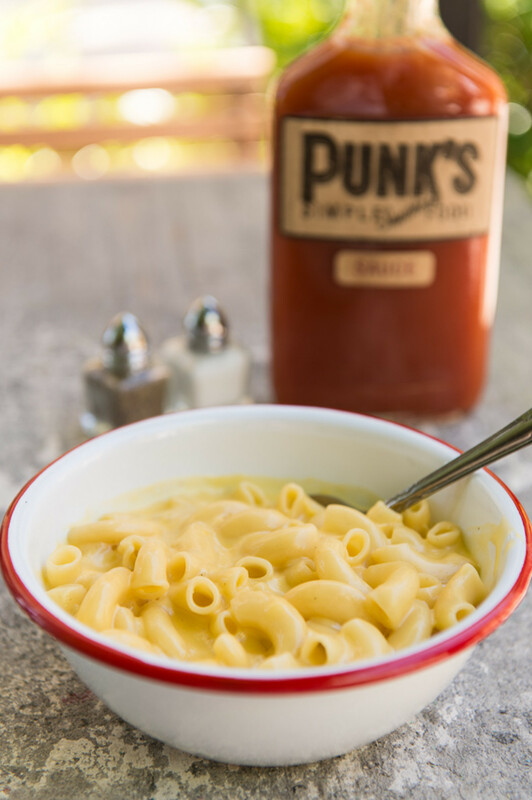 You can't beat a dish of simple mac and cheese. I made a revisit to Punk's last week after a friend mentioned experiencing some issues. I saw a few of those same issues myself. We had to ask for the cocktail menu to be brought to us, for one, and the biscuits that come with the fried chicken hadn’t been baked long enough. Indeed, they were a step away from being raw inside and had the squishy consistency of a packaged loaf of white bread. On our first visit, they had been perfect, with pretty brown tops and soft interiors. Obviously, there are still some minor issues being ironed out in the kitchen. They are indeed minor, though. The fried chicken was exactly the same as before—crispy and well-seasoned—and our server was terrific. You do indeed want to ask for the cocktail list, though, from which you can order a milk punch like a good Southerner. There’s a well-cultivated wine list, too. And for dessert, Punk’s features a different pie each week. We had the strawberry rhubarb with a crust so thick, flaky, and perfect it could have been featured in a Crisco ad. Now that's real Southern cooking for you.